If you’re in little Tokyo at the early bird special hour, do not think twice about yakitori house KokeKokko. First of all, being the duke of poultry, you better like chicken, because that is all you get on the menu. The occasional duck option makes a cameo, but as far dish diversity – only chicken. KokeKokko seems like the restaurant that only an episiode of Anthony Bourdain could dream up when roaming the streets of real Tokyo. As an Angeleno with the city’s considerable swath of Asian cuisine, we are privileged to have a place like KokeKokko, cooking up authentic Japanese skewers like they do over on the island. I doubt they have these type of eats in New York (maybe they do but I doubt it), but Los Angeles is an incredible hub for culture through food. 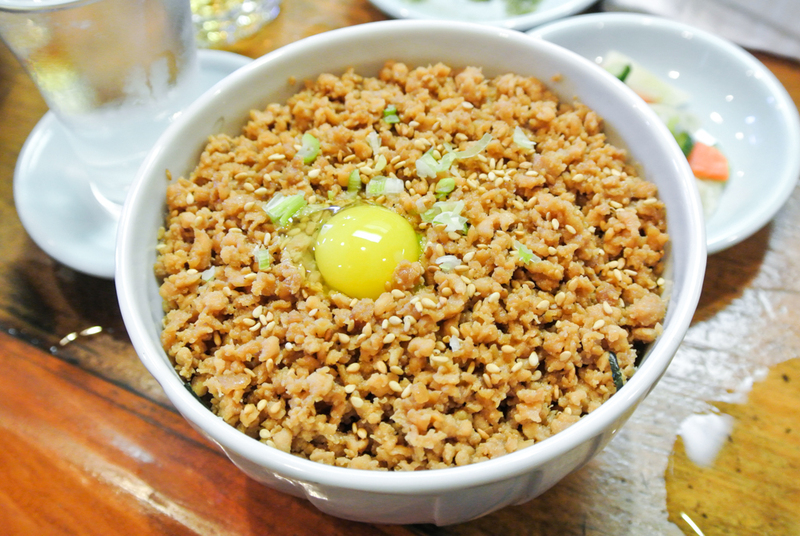 KokeKokko is a quaint, tucked-around-the-corner spot just off 2nd and Central in LA’s Little Tokyo. You walk in and there is a bar. Behind it is a hood over a yakitori grill with an old man standing like a stoic statue as a cloud of smoke pummels his face. 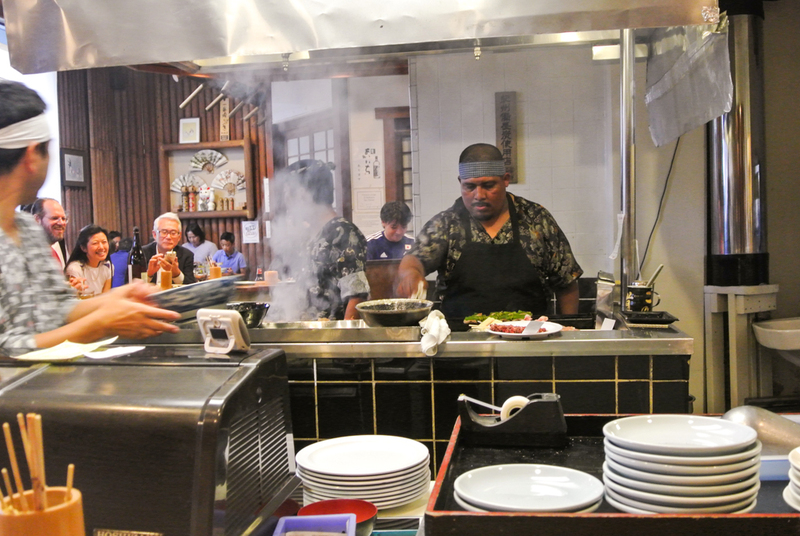 There’s a large sous chef who glances around the bar, silently determining which diners are respectful and appreciative towards the food, because in Japanese culture respect goes a long way. In this chicken shrine, the chef and his team of cooks and waiters decide based on respect exactly what you can eat, because the more you are liked, the more exotic and appealing the chicken sticks they provide become – essentially, the deeper the chicken coop opens up to you. Most people get a skewer thrown onto a square cream white-ish blue plate, but if you’re VIP, you eat on a black plate. And, if you’re super VIP, you eat on a black plate that has your name on it. It doesn’t get any realer than that. I heard about this joint through the grapevine for years. Some uttered about the legend of rare chicken being served… This legend holds true. I went with a good friend and fellow aggressive eater, Julian Pappas, who runs a food blog of his own – Food’s Eye View. This guy has been coming and going so many times, climbing his way up the chicken totem pole so desperately to achieve black plate status. In one very monumental step up in Julian’s KokeKokko career, Julian gifted a Dodger-edition Hello Kitty bobblehead to the chef. Who would have known that even full-grown and angry-looking Japanese men like Hello Kitty? So under the good grace of Mr. Pappas, we got some top-notch chicken treatment. 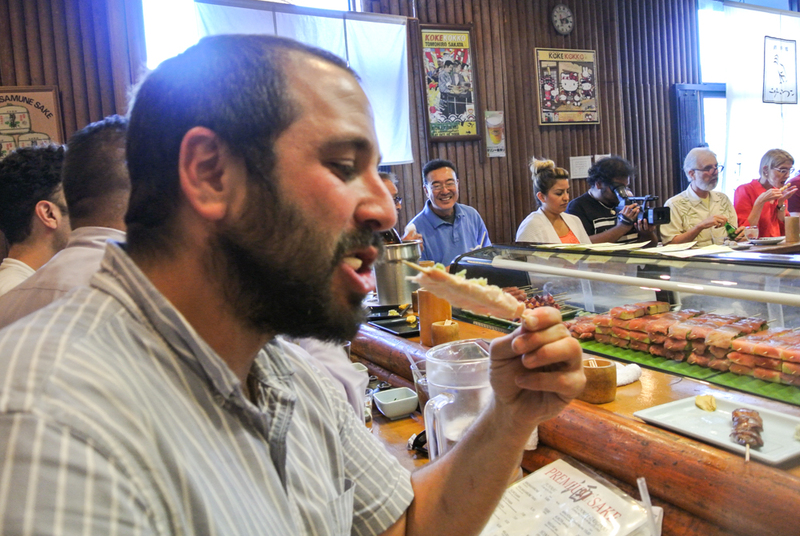 The Japanese dudes brought out almost every part of the bird: there were sweet livers with a subtle soy flavor – crunchy, gamey gizzards that complemented a swig of cold beer, followed up with a nostalgic piece of thigh meat. There were succulent and tender mushrooms with a low and intentionally lightly-seasoned farce meat. 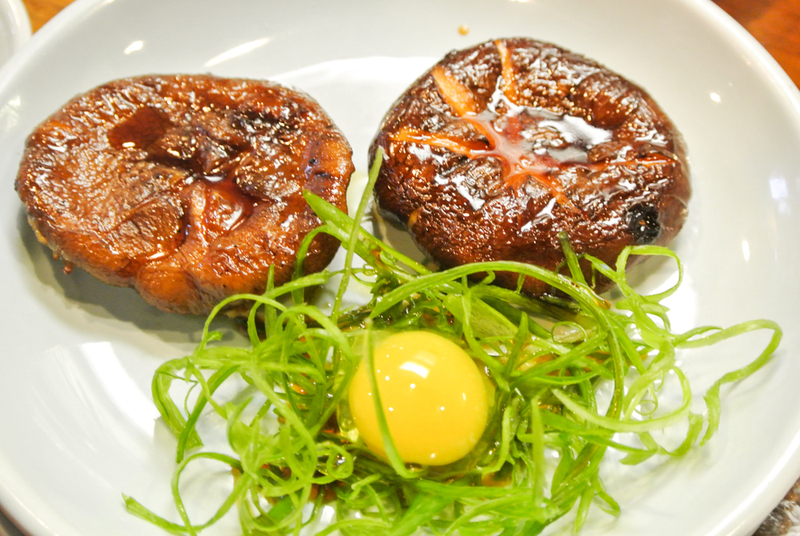 The dishes sang subtly like sushi and creativity rose to an all-time high when I bit into a grilled quail egg. Hanging on the stick like a cocktail olive, it had the character and smoke of the grill while the yolk still oozed inside with the delicacy of a poached egg. 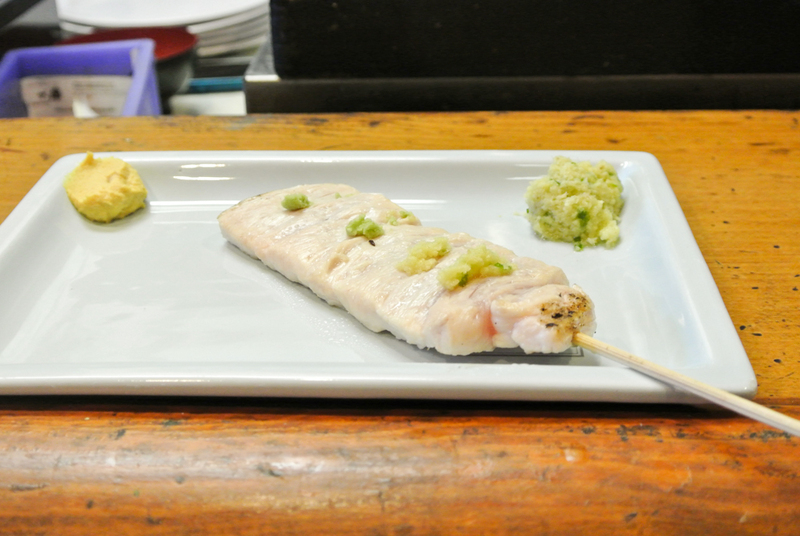 When Julian asked for fresh wasabi – an item not often offered at your typical Japanese restaurant – we got hit with the rare chicken breast, cut into perfect squares and grilled just enough that the outsides were white and the inside pink. When I dipped it in the little swab of ground ginger and dabbed it in fresh wasabi, I was teleported to a place I’d never been before… at least not with chicken breast ever – somewhere juicy and pure like a great steak. A perfectly cooked piece of protein. This is how chicken is supposed to taste like. The meal continued to journey into wonderment and it felt like we almost got everything. Two different types of hearts showed up, the first one being the normal sweet heart, which is the equivalent of riding coach on Jet Blue. Julian’s status earned us a taste of the first level in “special heart,” which had a completely different seasoning to it. KokeKokko is a must and not just one timer. 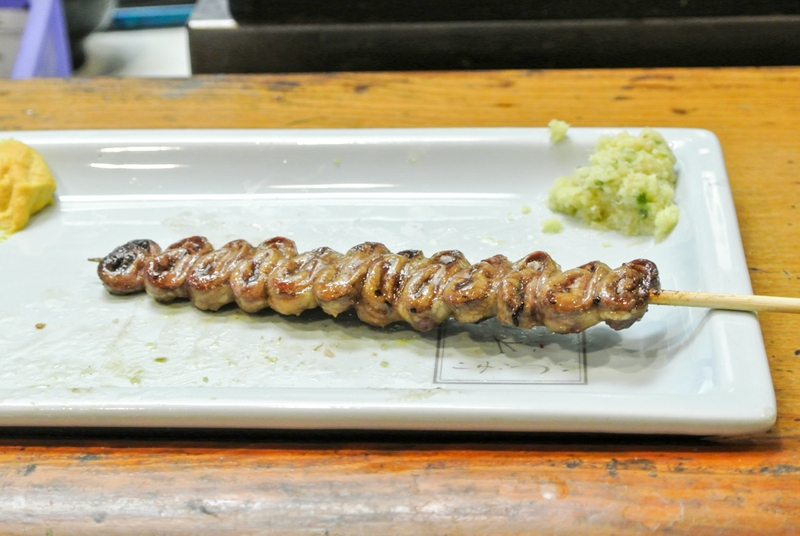 It is a grand traditional yakitori spot with so much soul and deep underground history. 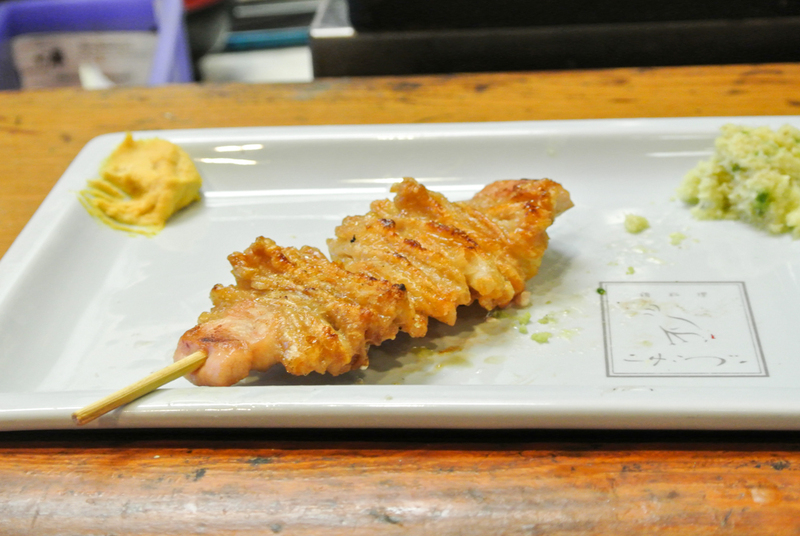 There was a beautiful orchestrated play between salty on one skewer and sweet on another, gamey and crunchy on one bite and clean and fatty on the other. I am going to continue to go, eating through more and more skewers, till I hit the super VIP and when I reach super VIP with Julian, we will be laughing over a bottle of cold overflowing sake and level 4 chicken hearts on our customized black square plates.